Social media is both a terrible and wonderful thing. 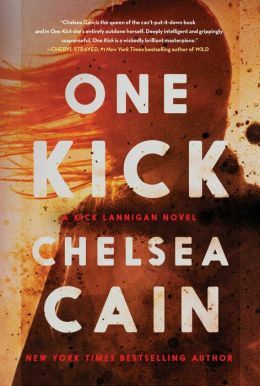 Case in point: I found out about Portland author Chelsea Cain’s new novel, One Kick, via an aggressive Facebook campaign by the author herself. That was the wonderful part. The terrible part was that I ignored all other responsibilities in my life until I finished the book, since I couldn’t put it down for the four days it took me to read it. One Kick is not your typical thriller, so don’t go into it expecting flash-bang action on every page. Don’t get me wrong—this is a good thing. Because One Kick is a psychological thriller that burns slow as you learn more about its incredible protagonist, Kick Lannigan. Kick, badass that she is, has a traumatic past, and you learn the nature of it in the first few pages. I have to be honest: the opening to One Kick is one of the most engaging that I’ve read since Marisha Pessl’s Night Film. I knew by the end of the first page that I’d be completing this book—and I had a pretty good feeling that I was going to enjoy it. I was right. One Kick certainly isn’t a literary novel—it isn’t going to appear on your Freshman Composition syllabus anytime soon. But when it comes to quality entertainment, this novel is proof that Chelsea Cain has secured herself as a master storyteller in a genre overrun by gimmicky plots and predictable twists. I don’t want to tell you much about the story. Watching it unfold and learning what is truly going on is one of the joys of this novel. But there are a few things I want to hit on in this review without revealing too much. The first is the depth of Kick, the main character. This is not some simplistic badass female with a bunch of knives and guns and a taste for vengeance. Kick is a deeply complicated and deeply flawed character, who just happened to like knives and guns. And we see that from the first chapter, when we first encounter her obsession with weapons. But the weapons aren’t for vengeance. As Kick herself tells us, what she does is part of her own “penance,” and when you find out what she’s seeking penance for, you will be shocked. Kick’s flaws lead to some rather heartbreaking moments in the novel. In particular, there is a scene in Chapter 20 that displayed the true depth of Kick’s emotions about her past. Again, I can’t reveal details, because much of the joy that I took from the novel was derived from the fact that I knew nothing about it when I first opened it, and I don’t want to deny anyone else the same pleasure. Nevertheless, One Kick is definitely a psychological thriller—and in fact, I would argue that with the introduction of Kick Lannigan, Chelsea Cain is exploring new boundaries of the genre. Fortunately, she has a knack for writing with a cane—that is, as soon as you finish one sentence, the next one hooks you. It is clear that Ms. Cain is writing a series here. While the ending wraps up most of the loose ends in a nice little bow, we’re left with a cliffhanger that will have to be resolved in future installments. And that’s fine, because I think the Kick Lannigan story is meant to be a slow burn. She’s not a character who is so one-sided that she can just jump up out of nowhere and inhabit the page—Ms. Cain has gone to exquisite lengths to ensure that the Kick on the page could just as easily be living out in the world among us. The book is technically solid, and I only spotted two typos as I read it. The writing is superb: Ms. Cain’s mastery of language is apparent throughout, and she can paint a picture with the simplest descriptions. But perhaps what I found most intriguing was her spelunking adventure into Kick’s psyche. When I say this is a psychological thriller, I mean it—the sections where we get the opportunity to see inside of Kick’s damaged mind are some of the most rewarding. After the book’s release, Ms. Cain ran into some trouble on Facebook and angered some of her fans. I’m not going to go into detail except to say the following: watching the marketing push led by Ms. Cain prior to the book’s release was a master class in self-promotion. Watching the “Facebook incident” was a public service announcement about how NOT to alienate your customer base. Either way, Ms. Cain teaches some valuable lessons not only with her writing, but with her aggressive self-promotion and the way in which she engages her fans. While you may not want to duplicate Ms. Cain’s Facebook experience, you would no doubt desire to duplicate her success. With multiple bestsellers behind her and a female protagonist for the twenty-first century, One Kick stands as a strong opening in what I hope will be an even stronger franchise.